It is my duty to Deconstruct not only this duck but everything. I must figure out what makes it tick…or should I say quack! 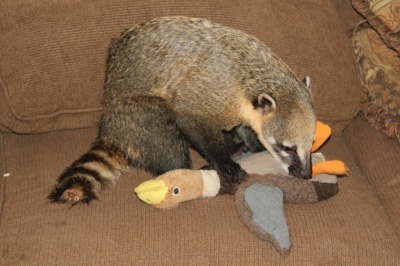 I must find out now..and don’t even think about taking it away from me..I can get very miffled and deconstruct you if you try..Now I am busy, back to work…Busy Busy Busy….. A busy Coati is a happy Coati and a bored Coati is another name for a house cat! You can quote me on that..over and out! Previous Previous post: Coati Cottage is at 98% done!